Information regarding the Cheneau family’s coat of arms remained unchanged in each of the three editions of the Red Book. A review of the Chenault Family National Association’s files reveals that the coat of arms first appeared on correspondence and newsletters in 1955. Thus, the acceptance of this particular image as the family’s coat of arms has existed for over 55 years. 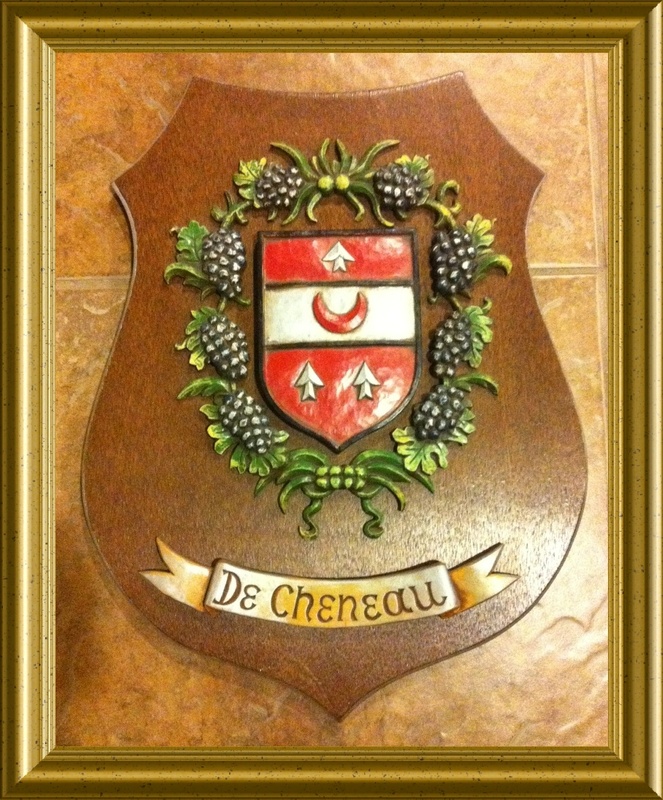 In the Charlton Rogers’ 1978 edition of the Red Book, the explanation first appeared that "Father Wassler of Canada who made a specialty of carving family crests from wood" had written that "The De Cheneau coat of arms certainly dates back to the 15th century. It seems strange that instead of plumes they surround it by grape vines and grapes. From the dark grapes we would conclude the people lived in or around Bordeaux. The half moon means that the bearer was the first son of the family and arrowheads that the bearer was in command of the archers. De Cheneau means of the little oak. The spelling varies in Canadian archives — Du Chesneau and the original spelling, Duchesneau." He went on to say, "The fact that it has no crest indicates that it is very old, and this is borne out by its not being quartered." The explanation included in the book states that most agreed that it is the coat of arms for the family descending from Estienne Cheneau...including all spellings of the name in the United States. Dr. Frank Chenault did extensive research on the matter, as did William A. Chenault of Louisville, KY, who made many trips to France. They pointed out that "the Chenaults of Paris have the traditional plumes on their crest." It is not believed that our family descends from the Chenaults of Paris. Although the history files of the association contain little information about this matter, a few handwritten notes have been found. However, it is unclear who wrote the notes as none of them bear either a name or signature. One of the notes appears to be the source of the information included in the 1978 edition of the Red Book compiled by Charlton Rogers. At the bottom of the note is an entry indicating that the source of the information is an original letter to Robert M. "Bob" Chenault from the Rt. Rev Msgr. Auguste M. Wassler from Carencro , LA, dated Feb 8, 1972. It also states, "Ludwig Kunninger carved the crest for Bob and Irene." Further, it mentions that, "the Msgr. was a friend of Ludwig and did research in archives of Quebec, Canada, spelling also Du Cheneau." Diane Moon, daughter of Bob and Irene, has graciously shared a picture of the crest carved for her parents. She is attempting to locate the original letter to share with the association also. Auguste M. Wassler was born 23 Apr 1897 in Alsace, France, and died Nov 1984 in Carencro, Lafayette, LA. During the time he served at St. Peter’s Roman Catholic Church located there (1947-1968), he researched and prepared the designs for the coats of arms for the families in his parish, which he then took to his friend in Dallas, Ludwig Kienenger, a Bavarian woodcarver. The designs were used to create the pews of the church that are such a beautiful asset to the church today. Thus, his knowledge and expertise was certainly a major factor in making the case in favor of the current coat of arms for our family. In addition to information provided earlier regarding this coat of arms, it has been determined that the presence of the grapes in the image has special meaning...liberality, felicity, peace, abundance, and wine-making. The appearance of red in the image means "warrior." One note to add, some have confused the appearance of either "de" or "du" preceding the name "Cheneau" to be a part of the family’s name. However, these words simply mean "of" meaning the coat of arms is of the family Cheneau. As additional information is discovered concerning the Cheneau coat of arms, it will be added to this site.